The Cooperstown Graduate Association (CGA), the alumni organization of the Cooperstown Graduate Program, organizes a variety of academic and social events throughout the school year. For information on any of these events, please contact Catherine M. Raddatz, Coordinator of Alumni Affairs. Wish you could step back into the classroom and learn about the new, cutting-edge scholarship being discussed? Now’s your chance! On Saturday, October 1, join CGP professors and alumni for sessions on dialogue training, digital technology in museums, new museum theory and topics, and helping the U.S. Army care for cultural property. Final Registration Deadline is Friday, September 16. Explore the signs, sounds, and tastes of 6,000 years of brewing history with Connecticut River Museum director Christopher Dobbs (CGP Class of 1998) and folk musician Rick Spencer). Tickets include program with beer tastings that reflect beer’s evolution from ancient civiliations to the modern microbrew craze. Every other fall CGA sponsors a scholarly symposium held in Cooperstown. A call for papers is made in the spring preceding the conference. Submissions are received from nationally known historians and material culture scholars as well as students from graduate programs in a variety of disciplines. The conference also coincides with our yearly hands-on workshops. CGP’s legacy is steeped in the dedication to the study of folklore and folk life. Until 1979, CGP offered a degree in American Folk Culture, and folklorists throughout the country recognized the program for its quality and dedication to the field. Although no longer a degree program, folk studies remains an important component of the CGP education and curriculum. A research and fieldwork course is required during the first year of study, and students learn how to conduct oral histories and record traditions and stories of the past. CGP also holds an annual lecture on a topic in folk studies. Every year, the program invites an established scholar in the field to share his or her expertise, experiences, and advice through a free evening presentation for the entire community and a professional seminar for students. Click here to learn about this year's Buckley Scholar as well as previous Buckley Scholars. 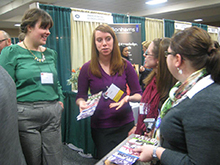 Alumni and current students meet during a CGA sponsored event at the 2012 NEMA conference. Alumni dinner held during the Chicago AAM conference.